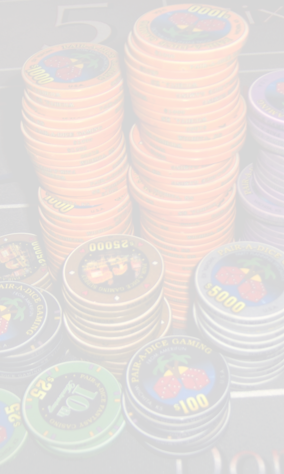 Thanks for visiting our Casino Supplies page. Since our main line of business is casino parties / casino nights, we naturally run across some great vendors. But we take it a step further and investigate deeper to discover the suppliers with the best product, at the lowest cost (sort of like us!). A fine example of the thinking above are the new synthetic gaming layouts, the newest thing to hit the gaming industry in 50 years. Traditionally, casinos have used screen-printed wool house cloth with great results. The only downside with a screen-printed layout was that to add many graphics, not only will it take a lot of time but it will require separate screens for each aspect as well as dry time in-between. Additionally it is not possible to get high resolution digital images with screen-printing. Well that has all changed with digital synthetic layouts. The layout is created by actually printing your design on a blank white cloth. 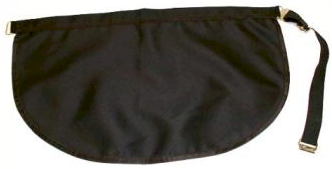 The finished product is wear-resistant and fade-resistant. We actually tested this cloth with a high-speed electric sander and the results were absolutely unbelievable. 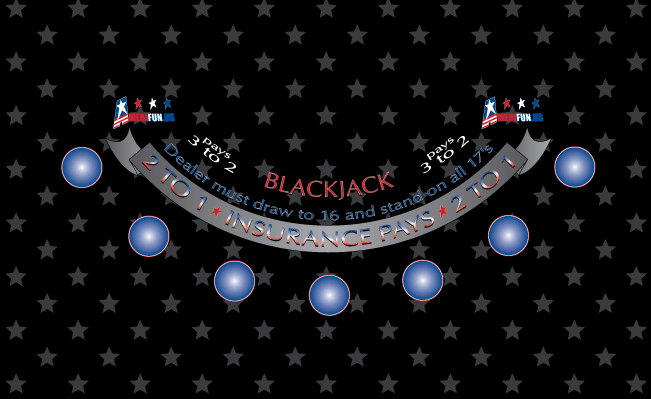 From $99 + $65 Setup + Shipping for blackjack or comparable table games. 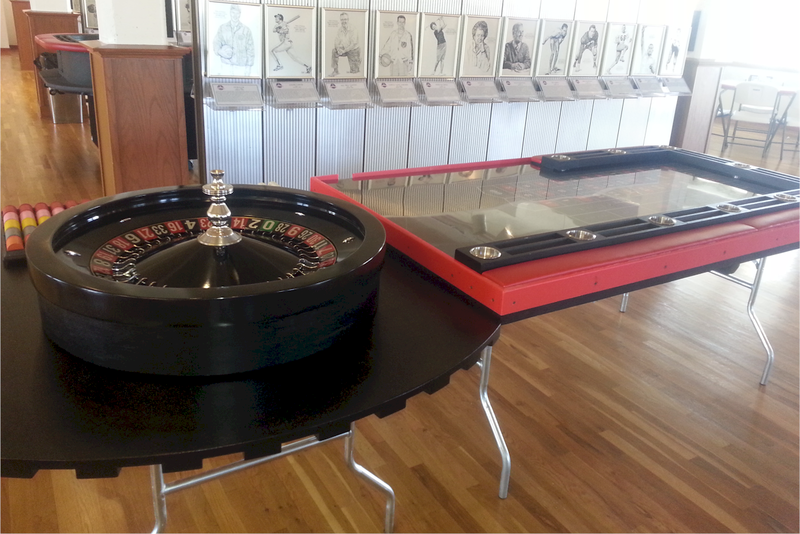 Roulette, Craps and larger games from $200 (6'). This cloth is 51" wide on the roll and the finished product will yield a 48" printed area. The length is unlimited and cut according to design. The advantage to this is that the size of the table is the only limit to the usage of these layouts. 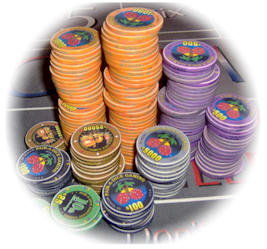 Premium-rate, first-quality CASINO SUPPLIES. This page under construction. 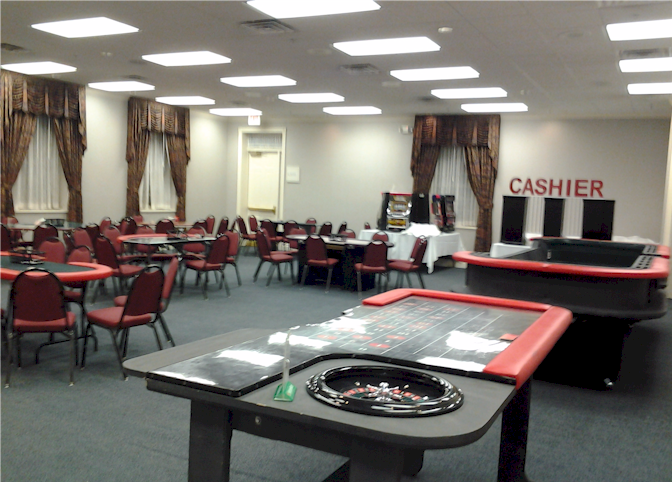 Our first casino night party was in 1997 but we have shopped around since the early 90's for casino supply merchants. It's funny how this has grown... In 1995 there were about five suppliers, now there are literally thousands. Now what does that tell you? Not that there are thousands of manufacturers that's for sure. Then and now, the report is pretty much the same: A handful of US manufacturers and numerous foreign manufacturers; however, nowadays there are thousands of distributors- the industry has really grown. If you are reading this then you know how to perform an online search. If you search for "casino supplies" you will be overwhelmed with millions of results. So what do you do? You can search link by link but you will notice some companies have one item and not another, or another company has both items but one item is more costly. You could spend literally hours, and only end up with a long list of suppliers that are roughly the same rate on most items. Save yourself the time and make one phone call to Amerifun. We have selected from a variety of suppliers and manufacturers to bring you the best rates while still delivering the highest quality. We offer true casino quality suppliers and accessories. VERY POPULAR: Traditional 36"X72" Felt Layouts (sold nationally for $29.95 or higher) at a low $15 from Amerifun. Economical Acrylic Dealing Shoes from $29.95 and Discard Holders from $9.95. Economical Gaming Cheques (Chips) from pennies on the dollar. If we don't list it, we can get it! Please Contact Us for more info or send us a Quote Request.